Our minds are always racing. Whether it’s work, the kids, what to make for dinner or the ups and downs of life, our mind tends to be in what seems like millions of places at once. 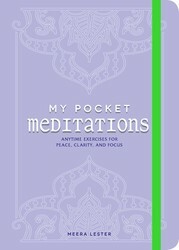 My Pocket Meditations by Meera Lester suggests a helpful exercise to release your mental clutter. Clear your mental clutter (emotional baggage, psychological block- ages, and self-defeating thoughts) if you desire to generate new thoughts, stimulate creative ideas, and spark spiritual connections. When your mind is less chaotic and more attuned to the Universe’s spiritual laws, you’ll notice synchronous events that yogis suggest are clues to your true destiny. To do this meditation, you will need a pen and paper and a safe and quiet place to do self-analysis. 1. Center your conscious mind to feel quiet and grounded. 2. Close your eyes and assess the chaos within. 3. Think of the distractions in your life and follow the next four steps. 4. Ask, what can I release right now? 5. Ask, what do I need to ponder further to find solutions and eliminate negative thinking? 6. Ask, what can I fix through an apology or making amends and then release? 7. Ask, what can I confront (with or without the support of a helpful, trained professional)? 8. Open your eyes and take the pen and paper in hand. 9. Jot down the answers to these four questions. 10. Close your eyes. Conceive a timeline (end date for ridding yourself of each item of mental baggage or clutter).7. Consider a to-do list for items than can’t be immediately released and need further action. 11. Open your eyes and write down your timeline and to-do list on your paper and put down the paper and pen. 12. Close your eyes and breathe deeply for three minutes. 13. Breathe out release. Breathe in peace. For more helpful tips for clearing your mind, take a look at Turn Negativity into Positivity with The Yogi Code. Experience a moment of peace anywhere with this beautiful, pocket-sized book that can help calm your mind and focus your thoughts throughout your busy days.Today’s hectic world is so full of distractions that it can often be overwhelming and draining. My Pocket Meditations offers you a portable pause button to temporarily turn off the noise and focus on what you truly need in the moment. You’ll learn the basic concepts of meditation and how to meditate, including various methods of meditating and how to use objects in meditation. Then you can choose from 125 meditations on more than a dozen topics including peace, love, friendship, hope, prosperity, and willpower. These quick yet powerful exercises allow for increased mindfulness and awareness. My Pocket Meditations helps you to ignore the distractions for a few minutes and take on the day with a calm, clear mind and fresh purpose.